The team at Tara Lodge, Belfast are celebrating today after being chosen as the winners of Guest Accommodation of the Year for Northern Ireland 2015 at the AA B&B Awards. The prestigious award was presented to General Manager Nora Douds and owner Conor O’Donnell at the ceremony in the Landmark Hotel in London on Tuesday 12 May 2015. The AA inspect and rate over 2300 guest accommodation properties throughout the country and the annual B&B awards recognises and rewards the excellent services provided by the UK’s very best B&B establishments. All the winners at the event are nominated by the team of expert AA inspectors. The AA stated ‘this award is the pinnacle of achievement for guest accommodation providers, recognising all aspects of the experience from the hospitality and service to the accommodation’. Located in the Queens Quarter of Belfast, Tara Lodge is ideal for exploring the wonders that Belfast has to offer. Located close to transport links, Tara Lodge is ideal for both the leisure and business traveller. General Manager, Nora Douds has been at Tara Lodge since 1999 and her energy, persistence and resourcefulness ensure guests expectations are exceeded during their stay. The luxurious, boutique bedrooms have a wide range of extras including Nespresso coffee machines, wide screen TVs and DVD players. Tara Lodge are no strangers to winning awards but this recognition from the AA is of special significance with recognition on a national level. Opened by Conor O’Donnell in 1998, Tara Lodge has developed from a 19 bedroom B&B into a 34 bedroom stylish, boutique style property. Managed by Nora Douds since May 2004 Tara Lodge has featured in the Top 25 UK Hotels in the Tripadvisor Travelers Choice Awards 2011, 2012 & 2013. 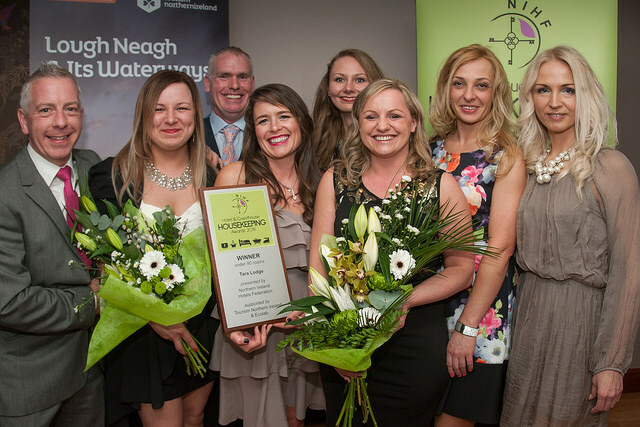 More recently the team at Tara Lodge have celebrated being awarded theNIHF Housekeeping Team of the Year 2015 (Under 90 bedrooms category), having previously taken the title in 2012 & 2013. The Front of House team are anxiously awaiting the announcement of the NIHF Reception Team of the Year at the gala ball awards at La Mon Hotel on Wednesday 20 May 2015. 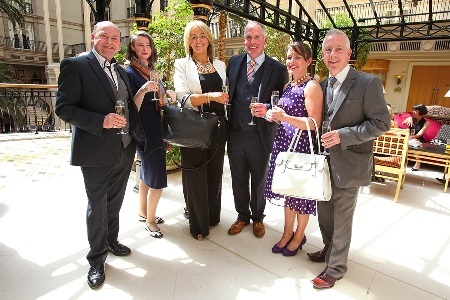 In addition Tara Lodge is a finalist for Belfast hotel of the year at the Belfast Business Awards to be held at Belfast city hall on Wednesday 27 May and is finalist in two categories at the glittering LCN awards on Friday 5 June 2015. Indeed 2015 is shaping up to be an exciting year for the team at Tara Lodge. Conor O’Donnell said on receiving the award ‘I am delighted and honoured by this award from the AA, a long-time partner and supporter of our work in Tara Lodge. I am vastly proud of the work that Nora Douds, our General Manager and her team have put into the success of Tara Lodge. I am pleased that their diligence, hard work and loyalty have been recognised by the industry. We are delighted to be setting the standard for excellence among the guest accommodation providers in Belfast and the wider region of Northern Ireland. You can make a reservation to experience all that Tara Lodge and the team have to offer at www.taralodge.com. Alternatively contact our reservations team directly on 028 9059 0900 to get the best hotel deal for a stay in our beautiful, luxurious bedrooms. You can enjoy the excellent a la carte breakfast, free high speed WiFi and access to our car park in a fabulous location in Queens Quarter, Belfast.